Just like painting the walls or positioning the furniture in your home, area rugs can define a space and how that space relates to the rest of the home. In the loft, Alex used area rugs to open up the living room, make the upstairs bedroom feel spacious and bring cohesion to the downstairs media room. The living room is part of the loft’s open floor plan, so it needed some definition. Alex selected a braided area rug made of Sunbrella yarn in Papyrus, a creamy off-white color that connects with the gauzy lightness of the Sunbrella sheers covering the living room windows. The rug’s light color also makes the dark furniture pop in a way that wouldn’t be possible on the loft’s dark hardwood floors. Manufactured by Colonial Mills, Inc., the rugs in the loft are braided with Sunbrella yarn from the Renaissance Collection, which contains 50 percent recycled Sunbrella fiber. And because it’s made of Sunbrella, Alex doesn’t need to worry about spills that come from entertaining in the living room. With soap and water, even the boldest red wine won’t stain this rug. In the upstairs bedroom, Alex needed to make the odd-shaped space feel bigger. He accomplished this with a rug – also in Papyrus – braided into the shape of the room. Because it covers almost the entire bedroom floor and extends to the top of the stairwell, the light-colored rug has the effect of opening the room and connecting it the rest of the loft. Had Alex selected a rectangular rug for the bedroom, it would have made the room feel smaller. The media room downstairs – nearly a perfect square – felt small. 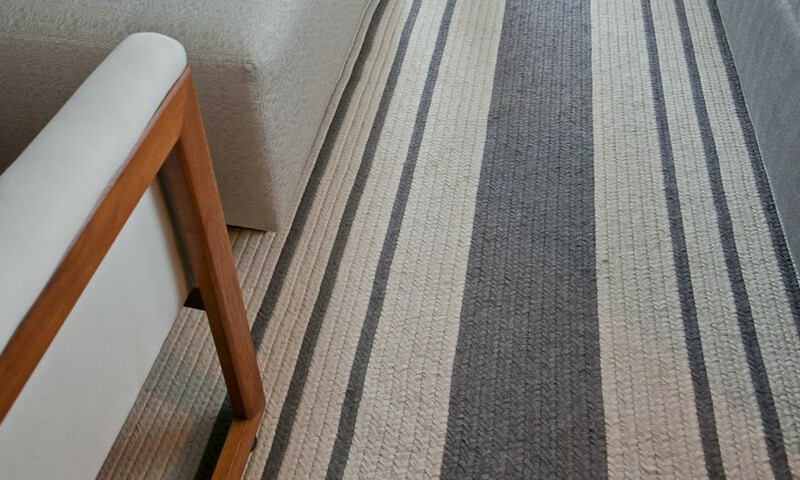 With the walls painted grey and the ceiling white, Alex covered the floor with another Sunbrella rug with alternating stripes of different widths in Graphite and Papyrus. The stripes visually open up the room and connect with a larger stripe created by the grey draperies layered over creamy sheers. Alex took some design risks in his rug selections, but they all paid off. When you think about using rugs in your home, don’t be afraid to think outside the box to create a look that brings the space to life. What do you think of area rugs? Tweet us @Sunbrella #perspectiveATL.